This really is a great refresher! Brilliant. The only addition I would suggest would be to load the gear and do a series of day trips before the main event. Get used to the bike being different and also, more importantly, build up your road fitness. 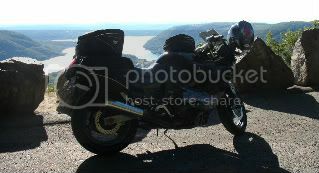 We do a lot of 2 up touring on a 750F Kat. The first year we found really hard physically and found we were better having shorter days but more consistent miles the doing big miles day 1 and 2. If you are doing long trips (3 weeks) plan for some "non-bike" days. We got caught in some really bad weather one trip so holed up in a motel for a day and just sat in the room watching movies. Next day clear weather and we were dry, sorted, and back on the road. Felt a lot better after a full day out of the saddle. So sorry to hear of CP's passing. This is an indispensable repository of information and wisdom. Ride hard and carry this friend in your hearts, fellow KR's.